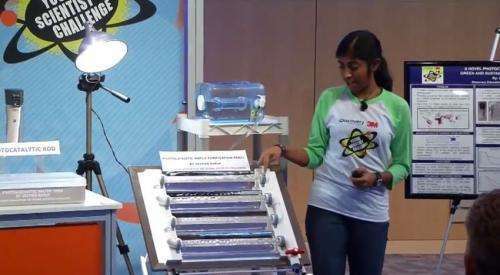 (Phys.org)—Deepika Kurup, a 14-year-old high school student from Nashua, New Hampshire, has won this year's Discovery Education 3M Young Scientist Challenge for her solar-powered device designed to kill bacteria in water. She now has the title of "America's Top Young Scientist," and a reward of $25,000 for her work. for students in fifth to eighth grade. Kurup entered the prestigious-science competition before she was in high school. This was her second time entering; in an another year's competition she had taken first place in her state. The advantages of her award-winning system are several. Its low-cost is just one benefit. In contrast to water purification methods using UV lamps that call for electricity or chemicals, Kurup's method runs "off-grid," yielding fresh-tasting water. Another advantage tied to her process is time; it can kill many types of bacteria in less time than other methods. Her judges saw her presentation as part of the competition at the 3M Innovation Center in St. Paul, Minnesota. The student's system involves exposing titanium oxide and zinc oxide to sunlight. The chemical reaction that this initiates forms hydroxyl radicals to go after and destroy types of bacteria. She counted the levels of coliform bacteria before and after she applied her system, with 3M Petrifilms, a microbiological testing process. The Petrifilm E.coli/Coliform Count Plate identifies both E. coli and other coliforms. Her system reduced the amount of coliforms from 8,000 down to 50 and E. coli from more than 1,000 down to none in less than eight hours. In one hour, she degraded methane blue. She used her back yard as her testbed, trying out her system with contaminated water from the Nashua wastewater treatment facility. Kurup's composite involved 3M Glass Bubbles, which the company describes as engineered hollow glass microspheres, intended as alternatives to conventional fillers and additives. The low-density particles are used to reduce part weight and to cut costs. The idea for her winning project came to her when on vacation in India, she said. Witnessing children drinking dirty water from a stagnant pool triggered her resolve "to find a solution to the global water crisis." Kurup worked on the project for three months, drawing on documentation including PhD papers about water purification methods. She also had contact with a 3M mentor, as scientists from 3M guide finalists through the translation from their concepts to prototypes. Kurup said she would like to further develop the water filtration project and, in the tradition of many adult scientists, she said her next step was "applying for a patent." Her ultimate career goal is to be a neurologist. The competition's second, third and fourth-place winners also showed innovative solutions. Second-place winner, Carolyn Jons, presented a packaging method to inhibit mold growth and keep food fresh. Third-place winner, Anin Sayana, had a project designed to selectively target chemotherapy-resistant cancer stem cells. Anishaa Sivakumar, in fourth place, had a project for helping to treat macular degeneration. I hope this comes to market, but if the past is any indication, cheap & effective innovations usually vanish into quiet obscurity, because no financial backer wants to back them, because they are too embroiled in their own greed. Maybe this time will be different. Sure hope so. More expensive,but it also produces power. Then why don't you provide the financial backing? Take out a second mortgage on your house and give the proceeds to this bright young woman. Don't worry about the financial risk to you and your family - just do the right thing! That way, you could help mankind and at the same time have a good feeling about yourself knowing you put a lot of what you've worked hard for at risk for something that (you know) will not produce a (monetary) return. Agreed, but doing it the simple way doesn't involve a lot of free advertising for 3M and it's products. Boiling water requires too much energy and you don't really want distilled water either. However, personally, when traveling I am using plastic bottles and sunlight (UV) for several hours. Of course this only works against biological harm, not chems. According to WHO: "UV units to treat small batches (1 to several liters) or low flows (1 to several liters per minute) of water at the community level are estimated to have costs of 0.02 US$ per 1000 liters of water, including the cost of electricity and consumables and the annualized capital cost of the unit." It tastes like crap and long-term over-consumption of iodine has health implications.